Tracey asks Rosemary if Sonia taught her the song too. Rosemary said she can't remember, but they used to sing it a lot together. Tracey sadly says that when her mum died she wanted to sing it to herself but couldn't remember the words. Rosemary says that she would have understood because that's the sort of person she was. Rosemary apologises for not looking after Tracey very well so far. Tracey says it's not Rosemary's fault she's just upset and doesn't want a new mum. Rosemary says she'd never try and replace Sonia – she just wants to be friends. They decide to spend the next few days getting to know one another, no pressure and then they hug. Ryan asks Gemma if she wants to go to the movies. She agrees and Ryan hopes that Harold doesn't put a curfew on her. She jokes that she just has a bell so he always knows where she is. Harold is behind her and clears his throat, as Gemma turns round she smashes the glass of orange juice on the floor. Harold tells her to tidy it up and goes to talk to Eddie. They talk about Harold raising the prices at the Coffee Shop and Harold tries to justify it with inflation. Dorothy visits to tell Ryan to go home and do his homework. She blackmails him into going home. Ryan leaves and Dorothy wants to talk to Eddie and ask him to keep an eye out for Clarey and discourage him from drinking as he will be looking after Ryan whilst she's away on her archaeological dig in Central Australia. Paul thanks Mel for coming in – who is desperately trying to show Paul her ring. 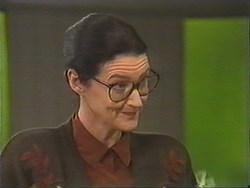 Paul tells her that Mr Fletcher wants her to go over and do some secretarial work for him. Paul is concerned about how Mr Fletcher drools over Mel when he comes in. Mel is still trying to flash her ring at Paul and he asks her if there's something wrong with her hand. MEL: You mean the fourth finger on the left hand? Paul finally notices, just a bit taken aback! He hugs her and congratulates her. Paul asks her if she can handle Mr Fletcher later, to which she says she can. Madge intends to have a quiet evening with Harold tonight, and tells Eddie this. Gemma and Harold come in. Madge tells her that she put a new blue t-shirt in the wash and now everything is blue – she has to be careful. 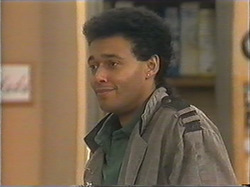 Madge asks Harold if she was too tough on Gemma but Harold thinks they have enough problems as it is. 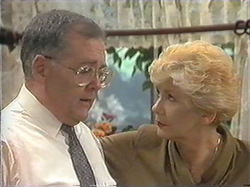 Harold is worried about buying out Des's share of the Coffee Shop and Madge wants to take his mind off it and ends up telling him about Jim and Beverly getting back together after his fling with Caroline. Harold never knew he had a thing with Caroline! There's the “Quite simply you're my friend” song playing in the background whilst Tracey and Rosemary bond, playing games and running around. There's lots of smiling and hugs. They fly a kite together, eat ice cream and visit the cemetery (presumably Sonia's grave). Rosemary is sitting on the beach and Tracey moves to comfort her. As the scene comes to a close the two of them walk hand in hand down the beach. A very beautiful scene. Mr Fletcher is a touch creepy! He tries to come on to Mel, who makes the excuse that her favourite pencil is back at the office and makes a swift exit. Mel tells Matt he's got to be Roger and come with her immediately. Paul comes over to the table and asks if Mel is done with Mr Fletcher, to which she says everything is fine and drags Matt away. Dorothy thinks that Ryan should throw all social activities away until he has done his exams, Ryan agrees but after tonight as he's going out with Gemma. Dorothy isn't giving him a cent until he does his work. Matt is dressed up, looking ‘tough'. Mel knocks on the door and introduces ‘Roger' to Mr Fletcher. Mr Fletcher doesn't look very happy! Matt or ‘Roger' is going to wait outside until they're done. Mel goes inside and Matt waits outside. A security guard tells him that he has to wait in the lobby because they've had a lot of burglary's lately. Reluctantly Mat agrees to go. Madge and Harold are cuddling up together in the kitchen, whilst Madge stirs some food. Gemma comes in and Harold pulls away embarrassed, asking for warning. Gemma asks if her Dad has sent any money for her with the board money, but Madge says they haven't had any money from Tom as yet. Harold gives her an advance on her wages. Madge goes to have a shower and Harold asks how much she wants. Gemma thinks it's too complicated and she won't bother. Harold gives her the money and tells her to enjoy herself. Mr Fletcher is getting a bit too friendly again. Mel shouts for Matt who doesn't come. She tries to get away from Mr Fletcher, by running off and accidentally knocking him to the floor. He's still conscious and she tells him the only memo she'll be writing in future will be to his wife. Rosemary and Tracey are talking about New York – Rosemary asks if she wants to live with her. Tracey thinks she'd miss her friends a lot. Rosemary tells Tracey that she can fly back whenever she wants as Rosemary always flies back on business. How about seeing how she likes it. Tracey thinks for a while then says she'll give it a go. Gemma goes to Ryan's for the movies but Dorothy tells her he has too much work, and shuts the door in her face. Mel has a goat Matt for leaving her – she could have been violated! Caroline laughs that it sounds like it was Mr Fletcher who needed protecting! Paul beats Joe at darts and tells him to get practising otherwise he won't get into the finals. Madge and Harold are on the sofa, cuddled up together. Harold wonders how Gemma is getting on, and how she didn't want to take the money and also about how he hopes Ryan will be have like a gentleman. Madge urges him to stop talking about Gemma. Gemma is walking in the dark and wet. She walks to the lake and looks at her reflection and cries. She looks up to the sky as they rain comes down heavier and thanks whoever is listening.